SAN FRANCISCO — For many years, Miami Dade College booths at high school college fairs were similar to those of other institutions, with staff doling out brochures and college-branded trinkets to whoever passed by. Furthermore, Miami Dade’s summer orientation for new students used to be similar to those of many institutions: a parade of college officials gave presentation after presentation to youths who were more engaged with their smartphones than with paying attention to explanations of what it means to be placed on academic probation and how to avoid it. However, after conducting surveys about these and other initiatives, Miami Dade officials overhauled their high school outreach and freshman orientation to make services and activities more personalized. Nowadays, they designate their counselors to liaise with specific, feeder high schools. At college fair booths, each counselor builds relationships with prospective students and their parents, and is considered the go-to person at Miami Dade for additional questions about admissions and financial aid. By the time new freshmen attend orientation, they have already been assigned an academic adviser who meets with them to register for their first semester of classes. Most of the typical welcoming speeches by deans and administrators have been recorded and parked into a web portal. Students can access them anytime — even if they end up on academic probation and are trying to improve their grades right away. She and others credit these kinds of revamped services to helping Miami Dade boost orientation attendance to 86 percent among first-time freshmen and its retention rate to 65 percent, a little higher than the national average among community colleges. 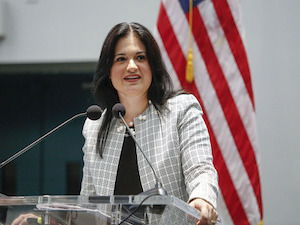 Rodicio’s remarks came last week during the annual conference of Achieving the Dream, which convened educators and policymakers aiming to advance community college reform and student success. Conference presenters and participants shared approaches and strategies to helping more students earn associate degrees and certificates by building clearer pathways to graduation, deepening community colleges’ institutional capacity, improving and increasing transfers from community colleges to four-year universities, and better engaging faculty in teaching and learning. Achieving the Dream is a national network of 200-plus community colleges trying to improve academic achievement and economic opportunity for students, especially low-income and people of color. Miami Dade enrolls more than 90,000 students, with 71 percent of them Hispanic and 17 percent Black. Titled “Miami Dade College’s Guided Pathway for Student Success and Organizational Agility,” Rodicio’s session explored what college officials have implemented in the past five years to improve student experiences and outcomes. Because about 15,000 first-time freshmen enroll there every fall directly from high school, “it’s critical for an institution of our size to keep moving students forward,” Rodicio said. She said that each freshman is assigned to a college coach from among Miami Dade faculty to mentor the student in the latter’s area of study. Each faculty member has no more than 15 mentees. Faculty are not paid bonuses but instead fit their mentoring into the standard 20 hours a week of office hours and campus service that is already part of their employment. Plenty of faculty stepped up on their own to participate, Rodicio said. On the academic side, Miami Dade officials also re-designed many of the remedial math courses so that the curricula are more problem based rather than lecture based, Rodicio said. This has helped contribute to a 60 percent passage rate in intermediate algebra. Although courses were also re-designed in reading, writing and English, math is where the most dramatic changes in student outcomes have occurred thus far, Rodicio said. She estimated that about 50,000 students across all races have been impacted by these and other changes, resulting in the graduation rate of Blacks climbing 17 percent since 2012, and for Hispanics 16 percent. However, the journey toward an associate degree can prove rocky. This was the focus of a session titled, “Exploring the Latino Male Transfer Experience,” featuring Dr. Márissa Vasquez Urias, an assistant professor in community college leadership at San Diego State University. Vasquez Urias shared findings from her study of 28 male Latinos who had transferred to four-year institutions in California after community college. Most were of Mexican descent with an average age of 25. Most were full-time students who spoke English and Spanish and held part-time jobs. About three-fourths of these men were first-generation college students, Vasquez Urias said. Many of them aspired to a master’s degree or law school. Interestingly, about half of her study’s participants had attended two or more community colleges before completing a degree. She found that regardless of the number of institutions attended, many of the men dropped out at least once. A common reason for dropping out was the allure of paychecks that could be earned without college education. “They didn’t see usefulness in a degree because their homies down the street were making good money in construction,” Vasquez Urias said of the study’s participants. In some instances, men who ended up on academic probation in community college sustained blows to their egos, causing them to drop out. Vasquez Urias said that a common reason for returning to community college was that the men grew weary of working multiple jobs to make ends meet while watching college-educated peers earn more and gain promotions faster than they did. When they did resume their formal education, many of the men found crucial emotional support from women, such as mothers or female counselors or teachers, Vasquez Urias said. Part of her research delves into the nurturing role these women had in the academic achievement of Latino men. To illustrate how easily these men had their confidence broken, Vasquez Urias shared case studies from her research of the 28 male upperclassmen. In one example, a fictional male student apologized to the community college counselor for being unable to make an appointment any sooner. The student explained that, outside of classes, he had been caring for his ailing grandfather while also having to shuttle a younger sibling to and from school because their father worked late. The student appeared embarrassed and said nothing more about his home life or family.